On Monday, President Donald Trump, signed an executive order, withdrawing U.S. from the trade deal, widely seen in China as a Washington-led attempt to contain its rise. The Obama administration was actively steering the formation of the 12-nation TPP — a free trade deal, which included Australia, Japan and Vietnam, but excluded Beijing as a partner. “The TPP, in any case was an unrealistic initiative as it excluded China. After all China is biggest trading partner with 128 countries, and has unique comparative advantages,” said Wang Yiwei, Professor in the school International Relations at Renmin University, in a conversation with The Hindu. 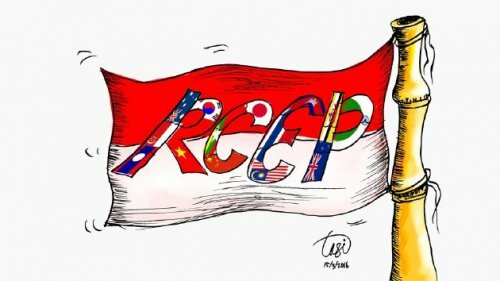 Instead of the TPP, Professor Wang backed the RCEP, which has the 10 countries of the Association of South East Asian Nations (ASEAN) as the core of the proposed free trade agreement. Besides, six other nations — India, China, Japan, South Korea, Australia and New Zealand are part of the proposed arrangement. “The RCEP is an inclusive proposal. The U.S., if it wants can also join as partner in the future,” Prof. Wang observed. On Tuesday, Chinese foreign ministry spokesperson, Hua Chunying pointed out that Beijing will back further negotiations related to RCEP, which have already made substantial progress and should be completed at an early date. Ms. Hua also advocated that the formation of the Asia-Pacific free-trade zone should be further advanced, as leaders of Asia-Pacific Economic Cooperation (APEC) member economies have also agreed on a vision and a plan for this arrangement. In the Asia-Pacific, the response to the U.S. exit has ranged from those who have now begun to re-focus on the RCEP, to others who wish to revive the TPP, with China as its new member. Reuters quoted New Zealand Prime Minister, Bill English as saying that the United States was ceding influence to China and the region’s focus could switch to alternative trade deals. “We’ve got this RCEP agreement with Southeast Asia, which up until now has been on a bit of a slow burn, but we might find the political will for that to pick up if TPP isn’t going to proceed," he observed. On the contrary, Australia’s Prime Minister, Malcolm Turnbull, highlighted that, "Losing the United States from the TPP is a big loss; there is no question about that." He added: "But we are not about to walk away... certainly there is potential for China to join the TPP." Reuters report pointed out that the former U.S. President Barack Obama had framed the TPP without China in an effort to write Asia’s trade rules before Beijing could, establishing U.S. economic leadership in the region as part of his "pivot to Asia". In Beijing Ms. Hua, when asked whether China could play a bigger role or even assume leadership, stressed that the word "duty" is more accurate than "leadership" to describe the situation.